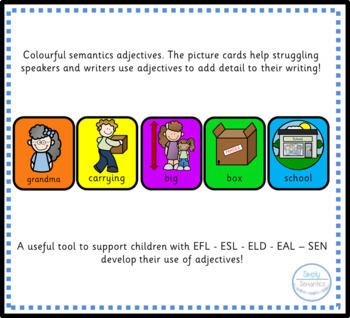 A useful tool to support children with EFL - ESL - ELD - EAL – SEN add detail to their writing. Colourful semantics adjectives. The picture cards help struggling speakers and writers use adjectives to add detail to their writing. This growing pack contains 54 adjective cards to get you started. Follow my store to be notified when the product is updated! 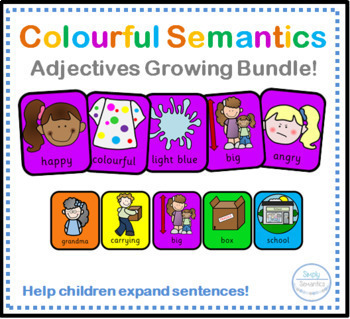 Colourful semantics is an approach created by Alison Bryan. It is a great way to support children who struggle to write independently. The colour scheme relates to the types of words in a sentence: Who? (noun) Doing? (verb) What? (object) Where? (location). Children use the strips included to help them structure their own sentences.